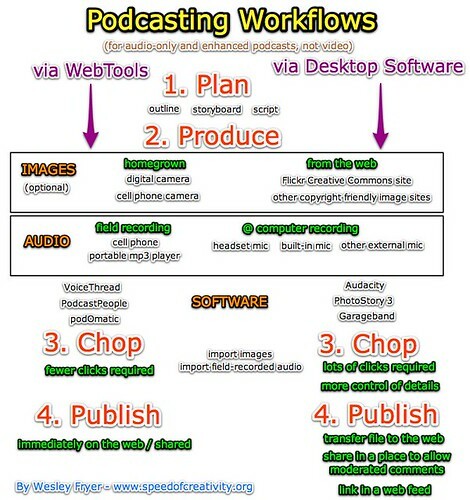 I have been thinking quite a bit about the differences in using web-based tools like Voicethread, PodcastPeople, Bubbleshare or podOmatic to create audio-only or enhanced podcasts (technically speaking I suppose, “digital stories” since Voicethreads and Bubbleshares are not yet true podcasts) compared to desktop software like Audacity, PhotoStory3, or Garageband. In the past, I’ve spent most of my time in digital storytelling workshops helping teachers use desktop software solutions. That is shifting now because of several reasons, but a basic one is this: Web tools for digital storytelling require fewer clicks to complete a project. When using a tool like VoiceThread, literally five clicks after finishing the producing and chopping phases (steps 2 and 3) an entire project is published to the web and safely shared for feedback with others. It is true that iWeb software (for Macintosh users) makes podcast and other iLife media file publishing very seamless, but the configuration of the iWeb publishing scheme can take some fiddling (especially if the user isn’t a .Mac subscriber or trial user) and is in another league of complexity, in my view, compared with a tool like VoiceThread. In addition, I am still not entirely thrilled with the commenting options available with iWeb, and generally prefer web-based platforms for commenting and blogging. To put those thoughts into action and to a test, today I extended an opportunity to accompany a group of elementary students to the Oklahoma History Center— and created a podcast with them. Several of the students recorded audio “in the field” at the museum using a cell phone (and Gabcast,) and took pictures of the objects they had described or read descriptions of into the cell phone. I took those images and audio files (which were readily downloadable as compressed mp3 files from my channel on the Gabcast website) and created two versions of our digital story: One using Voicethread and one using Garageband. I also recorded screencasts of the process and required steps in each case. Creating the Voicethread version took just over 15 minutes. Creating the same story in Garageband took over 45 minutes. I included eight images and eight audio narration recordings in each story. If you have feedback, comments or suggestions on any of this I’d love to hear it. I want to continue to improve the digital storytelling learning opportunities for our Oklahoma Digital Centennial Project, and one way I think I can do this is by spending more time helping participants learn to use web-based tools like Voicethread and Gabcast. Please don’t be put off by the fact that I used Garageband and not PhotoStory3 software for this demo, if you happen to currently be a Windows-user. These procedures in PhotoStory3 are VERY similar, David Jakes’ step-by-step handout for PhotoStory3 is a great guide to use in workshops with teachers, and I have it linked on my digital storytelling workshop curriculum. Also remember the web-based options to use VoiceThread and Gabcast as digital storytelling tools are available to EVERYONE connected to the web, regardless of platform, IF the site is not blocked by a local Internet content filter. While I think elimination of clicks is nice and important, I worry about this leading to shallow, less compelling work. Quality digital storytelling really takes time (as you well know)and involves many steps. While I understand that this may not constitute digital storytelling and serves a wonderful purpose of sharing quickly, I simply would caution people to think about the value of both quick representations of learning and yet not abandoned the idea of creating powerful stories that involve scripts, fine tuning audio, video and images to produce stories with larger messages. Perhaps this is where we start. Certainly for younger students, this is a great way to easily publish and allow students to do most of the work. For you and I we’ve experienced the hard, time consuming methods and are thrilled and astonished at the ease of publishing multimedia. But like blogging, it can quickly become and will become a storehouse of meaningless work. My hope is the students and teachers will see be interested in taking it deeper using tools that offer more complexity and yet will involve more steps. Absolutely Dean, that makes perfect sense. I think others like Gary Stager are sometimes critical of digital storytelling because of examples which are shallow rather than deep. I am not advocating for shallow education of any sort, but rather in depth education characterized by students thinking deeply, reflecting about ideas, and actually creating knowledge products as a result of their hard work. Similarly I’m not advocating Animoto as the ultimate digital storytelling tool. It is certainly cool, and as you say amazing to see when you’ve worked in more labor-intensive ways to generate snazzy multimedia effects to see how few clicks that can take now with a site like Animoto, but that does not mean deep thinking, real learning, or authentic education has taken place. The context I’m working in is a desert of student media use. I’ve shared tools like PhotoStory with MANY teachers, but I see VERY little usage happening. Of course there are multiple reasons for this, and the culture of high-stakes testing along with the overwhelming number of mandates teachers must meet each day contribute significantly to this culture. I continue to maintain it is important we put the technology into the hands of the students, and let them CREATE with technology tools. To that end, having teachers just let students do ANYTHING with a tool like VoiceThread is a real step forward in my context. So, I agree with your points, we don’t want shallow digital stories after we’ve been using these tools for awhile, but I think it is ok to start with simple uses when you’re starting. Speilberg didn’t make a blockbuster his first film out of the gate, I don’t think. I’m really working to encourage actual adoption of technologies by students and teachers in classrooms, and to that end I see this “ethic of minimal clicks” being really important. Early adopter/innovator teachers are going to use PhotoStory or Garageband to make projects, but my experience tells me not many early/late majority teachers will. I’m thinking the easier process afforded by a tool like VoiceThread will make it more appealing and usable for early/late majority teachers when it comes to technology integration. I may be wrong of course, but those are my thoughts at this point. Informative post Wes. Very useful. I agree that production of the output and use of the tool should be as seamless as possible. Particularly with respect to podcasting that final step of ftp was always a hurdle that could make or break a teacher’s adoption of the technology. Another element that created a hurdle was vodcasts on the Windows platform. Two events happened recently that provided a very elegant solution. First of all, a Singaporean friend, Kevin Lim [ http://theory.isthereason.com/ ], presently living and researching in the USA, pointed out to me that embedding video in a blog and then subscribing to the RSS feed would be a simple way to vodcast. Secondly, with the advent of the video embed button in Blogger this process has been rendered much more easier. One embeds the video in a blog post, subscribes to the RSS or Atom feed in ITunes and you have your vodcast. No need to worry about ftp. Blogger processes the video for you. It is platform independent. In short, one follows these steps. 1. Record your video using a digital video camera and process the digital video using iMovie (Mac), Windows Movie Maker (Win), or Adobe Premiere, etc. Yoiu could also record the video directly using a web cam or iSight (Mac). 2. Upload the video to a Blogger blog within a typical post. 3. Obtain the RSS feed address for that blog and subscribe to it using the “Subscribe To Podcast” menu item in iTunes. The video feed within the blog will be accessed by iTunes and the embedded videos will be downloaded. One could also subscribe to the vodcast using Google Reader, for example. I have set out some instructions for establishing a Blogger blog and the Vodcast at the links below if your readers are interested. I have one issue with Blogger. The navigation bar and its problematical “Next Blog” button. I use some code just before the default code and after the name of the template creator to block the Blogger Navigation bar. The detail on how to achieve this is described at this web site. I feel that if the tools are easier to use then the technology will not get in the way. Initial uses of any technology in educational settings is rarely deep. My first experiments with HyperCard stacks were pathetic in comparison with those that followed. It takes practice and application. Teachers and students observe uses of the tool, think to themselves that they could improve on that product and gradually better quality outcomes are achieved. For example, today I read a blog post by John Maklary where he describes how he is embedding Voice Thread examples within Google Earth place marks. Most creative. It is good to see the use of tools being expanded in different directions. I also immediately thought of Gary Stager’s criticism of Animoto when I started reading your post, but on further reflection decided this is quite different. While Animoto gives no options beyond selecting images and music – well, as far as I’ve seen in my brief exploration of it anyway – VoiceThread offers quite a bit of flexibility in terms of visual editing, and the voice comments are certainly very powerful. And yes, if using tools that allow for (and possibly even require) detailed fine-tuning means most teachers just won’t do it, then I think it’s well worth it to simplify things a bit, as long as it doesn’t take the creative and thinking part out of it. That’s certainly my experience from my school, where many people want to use ICT more/better, but just have such busy schedules. I think VoiceThread does a good job of retaining the reflecive aspects and also enough of the creative flexibility to make it fun to use. Of course, there are times when the trouble-shooting, iterative trial-and-error type work is just what you want, so it’s great to have a choice of tools. It’s funny how little differences between programs can make a big difference in how kids and teachers receive them. Shallow, deep, the fact remains that it is much easier to dwell at the high end of the revised Bloom’s Taxonomy than ever before. For me, the argument is equivalent to going deep sea diving…you can go down in a submarine or a diver’s suit and risk the benz, but at the end, the focus is on exploring the beauty of new learning environments. Current curriculum efforts aren’t focused on plunging the icy depths, instead focusing on covering content. If schools were interested in the depths, then approaches like problem-based or inquiry learning would prevail. It is those approaches that make learning relevant, the technology that makes communication and collaboration all the more possible. In reviewing these resources, Wes, I have to tell you that I’m blown away by how neatly you’ve summarized the process here. 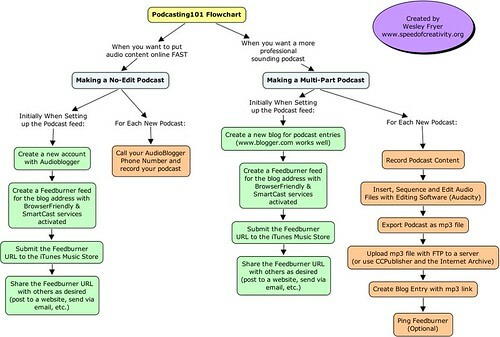 I applaud your work, especially the flow charts, in making podcasting understandable for the masses. I’ll be sharing your charts in upcoming podcasting workshops I’m doing with district staff. May I include the images on wiki web pages? I know we’re on the same page on this but the proliferation of content that lacks depth (not just in digital stories but all content)has made me more cognizant of what exemplary work looks like. They stand out among the piles of poor work. I think it’s incumbent upon people in leadership to help teachers not only see easy entry points but focus on exemplary work. Certainly not a criticism of your work, just a thought rolling around my brain. Wes, a most informative and well illustrated post. I agree that the elimination of clicks is important. There is a “desert of usage out there”. Students can get caught up in the tools at times. The technology can get in the way so the elimination of clicks can be a positive step. Usage of the tool should be seamless. Dean, you make an excellent point when you conclude that “it’s incumbent upon people in leadership to help teachers not only see easy entry points but focus on exemplary work”. I saw a recent example of this when one of our local principals attended a conference here in Australia and brought along 7 of his staff to get some pd on the tools and to see good exemplars. If only all our leaders could follow this example. Time is the most precious element. My initial thoughts were that the web-based products are of a lesser quality and are inferior… but our goal is not to produce HD Gold, stereo DVD, etc, performances. It is to educate…did they get it? I think there is a time and place for all of the open source products available to us. The key is, that we engage with those products. Great post.